So it turns out a big fitness blogging conference will be taking place in my own backyard this summer. 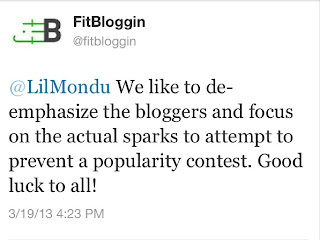 That's right - FitBloggin' 2013 is coming to Portland! How amazing is that? I would love to go, but finances are a bit tight to justify the $$ to attend so I didn't give it much thought. Then, I saw posted on Twitter the opportunity to apply to be a presenter! Yeah, right! I know, I know, socially awkward me, up on stage? Even if it is contained to just 5 minutes, we're all pretty confident I'll vomit either before, after, or during the presentation, right? But I actually feel like I could maybe do this. Have I lost my mind? Possibly. The only problem now is getting chosen. Voting is open from now until April 9. 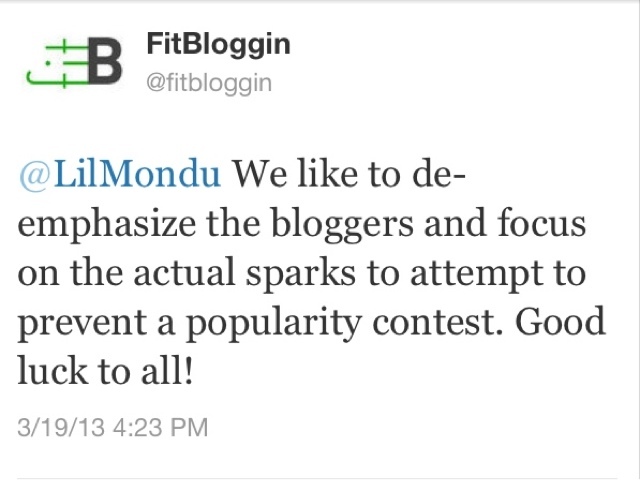 The 7 bloggers who "ignite the most spark" (aka get the most stars/votes) will be chosen and announced on April 10. Then a panel will choose an additional 7 the following week from the remaining pool. Those 14 lucky ducks will get free passes to the conference, along with the opportunity to share their passion at the conference, and I want to be there so bad! Unfortunately, the spark I wrote is a little lackluster (read: I'm way self-conscious about it and wish I'd had someone proofread it for me for some confidence boosting), and that is entirely what the vote is based on. No names, no blog affiliations, just a spark (aka pitch). The organizers want to keep this from being a popularity contest, for which I am GRATEFUL. Let's face it, I don't have the biggest blog on the block. BUT, I could really use a little help from my friends. You can vote for more than one spark, but you can only vote once for each. Each vote is given weight by the number of stars you give (1-5). I'd love for you to vote 5 stars for me if you think I could ignite a little spark for fitness! I voted for you! I thought about going to FitBloggin...and I was really, really tempted. But it just doesn't work out right now for us. There is the $$ concern, but also this is a really, really crazy time for my husband's work and, well, if it were any other year, I'd be there...sigh! I just voted for you!!! I hope you get chosen. I know how you feel, I am dying to go to a conference!!! !